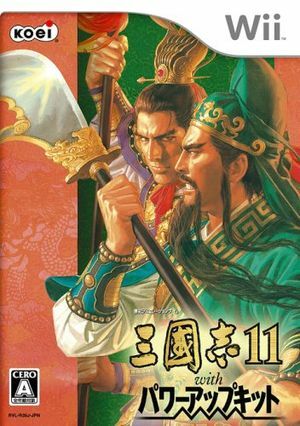 Sangokushi 11 (三國志11), known in North America as Romance of the Three Kingdoms XI, is the 11th installment in Koei's Romance of the Three Kingdoms. It was developed and published by Koei for the Wii. The game is based on events that took place in China during the 2nd and 3rd centuries, drawing from the historical novel Romance of the Three Kingdoms and the historical text Records of the Three Kingdoms. Gameplay revolves around managing numerical statistics, each representing an attribute of a city or character. For example, a city will have statistics indicating the amount of food stored within its walls, its vulnerability to disasters such as floods and earthquakes, how content the people are with its ruler or governing officer, etc. Characters have statistics to reflect their fighting prowess, intelligence and loyalty towards their respective lords, among other attributes. The goal is to constantly improve to build the greatest empire and conquer other lands. The graph below charts the compatibility with Sangokushi 11 since Dolphin's 2.0 release, listing revisions only where a compatibility change occurred.